To use Turnitin on your iPad you need to first install the Turnitin Feedback Studio App and a generate Class Access Link from your Moodle Course. On your iPad, open the App Store. Search for "Turnitin" and install the Turnitin Feedback Studio App. UNSW uses an LMS integration to access Turnitin so you cannot use the Username and Password fields. Instead, access to use the iPad app will be accessed via a secure link which instructions below outlines how to receive a secure link. On your course homepage, open the Turnitin assignment link. On Submission Inbox tab, open the Turnitin Document Viewer Feedback Studio by clicking any link for a submitted assignment. In the Document Viewer, click the info icon at the bottom of the right side toolbar. An info pop-up box will appear with details of the submission. At the bottom of the box, enter your email address and click on Email me button. You should then receive an email from Turnitin with an access link. 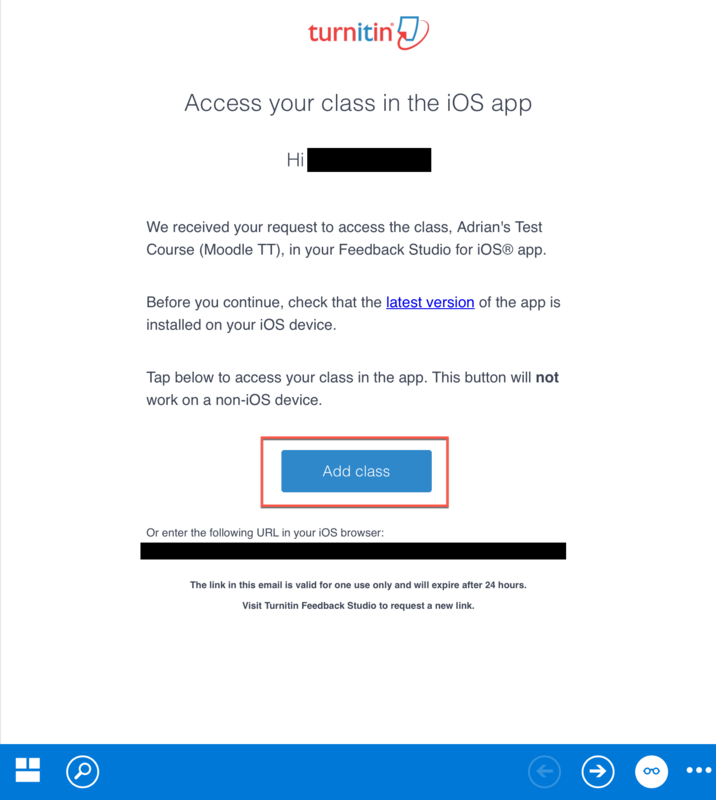 Open the email on your iPad and click on the Add Class button. The Turnitin Feedback Studio App will automatically open and all Turnitin assignment activities from your Moodle course will be linked. Note: The email must be opened on your iPad for the Add Class link to work. Once pressed, the Turnitin Feedback Studio Application will launch with your Turnitin assignment activities showing. Navigate to your other Moodle course. The Turnitin Feedback Studio App will automatically open and all Turnitin assignment activities from your added Moodle course will be linked. Under Accounts on the right side menu, you can drill down to view the classes you're teaching, the assignments for each class, then the submissions for each assignment. You can then view, evaluate, grade and provide feedback for submitted assignments. uploads student grades and teaching feedback from the iPad to the Turnitin website. When viewing the submissions of an assignment, tap the Assignment Info button on the top right toolbar. This button will only appear on when viewing an assignment. In the resulting pop-up, tap Sync Submissions to toggle synchronisation on or off. Synchronisation happens automatically when your iPad is connected to the Internet. Time taken to complete synchronisation can vary depending on the number of assignments, assignment size and internet connection speed. Note: downloading and synchronising assignments with Turnitin for iPad uses the data connection (wifi or mobile) on your iPad. You should be aware of the data limits on your wifi or mobile connection as the download size could potentially be large depending on the number of assignments you are downloading and the file sizes of individual assignments. The information button is context sensitive and will only appear when viewing an assignment. Tap to view assignment information including key dates, number of submissions and number of grades given as well as turn synchronisation on or off. Use the profile button to add new classes or logout the iPad from Turnitin. Displays recent activity on your assignments. Also tap Sync Now to immediately synchronise notifications and assignments from the Turnitin website. On the Turnitin for iPad home page, in the Accounts sidebar, tap University of New South Wales for a list of your UNSW courses that include Turnitin assignments. Tap the relevant course name. Links to the course's Turnitin assignments display, along with a progress bar showing the number of assignments graded in relation to those submitted. Tap a link for an assignment. Links to student submissions for that assignment display. Tap a student's name. If this is the first time you are accessing this assignment, the Sync Papers pop-up will display. You can change this setting later via the Assignment Information button. The student’s submission displays. You can begin evaluation and grading. We recommend that you Sync Submissions so that newly submitted assignments will be automatically downloaded while online, using your current internet connection. If data download limits are a concern, you may disable Sync Submissions to prevent the chance of automatic assignment downloads exceeding your limit. If disabled you can manually download papers as required by tapping the Download button next to the Student's name. A Turnitin assignment Originality Report is accessible from within the assignment page. Tap the bar-graph icon at the top right. In the Similarity Report pop-up, tap the OFF/ON toggle switch to see the matched text highlighted in the assignment (the bar-graph icon is now replaced by the assignment's similarity score). Any matches are listed in the originality report menu and numbered and highlighted in the assignment text. In the originality report menu, tap a match to display a summary and, if available, a link to the source that contains the matched information. When marking assignments on an iPad, you can use Turnitin's QuickMark facility to provide targeted feedback (both commonly-used and individually tailored comments), as well as providing more general assignment feedback. This page contains instructions for providing both types of feedback. QuickMarks are commonly used notes and comments that you can add to Turnitin assignments during the marking process. QuickMark phrases are provided or created in sets, based on the feedback purpose. Using QuickMarks can speed up marking by reducing typing time. It also helps markers maintain consistent feedback to students. On the assignment page, tap the word in the text where you wish to leave feedback. Tap and hold to highlight an entire line. Options display at the highlighted text. Tap the checkbox icon to display the QuickMark menu (the default Commonly Used set appears first). Tap a QuickMark phrase to display it next to the chosen text. Once it is in place, you can tap it to edit or delete it, or move it to a new location. Change the colour of the highlighting, if you wish. Access other QuickMark sets by tapping the menu icon at the top left of the Commonly Used pop-up. You can insert comments throughout a Turnitin assignment that display to a student as speech-bubble icons, which the student clicks to read your feedback. These allow you to write longer comments at specific points in the text without covering the document. Tap the speech-bubble icon and, into the Comment window, enter your comment and tap Save - or you can Save as new QuickMark if you think you'll be using this comment often. Once saved, you can tap to edit or delete it, or to move it to a new location. Change the colour of the highlighting if you wish. Tap the assignment page in the margin or between paragraphs, where you wish to leave a text comment. In the screen menu, tap the T icon. A field with a blinking cursor will display on the assignment page. Enter your text comment in the field. Tap outside the field to save the comment. Tap the comment to edit or delete it, or to move it to a new location. On the assignment page, tap and hold to highlight an entire line. Options display at the highlighted text. You can adjust the highlighting using the blue handles at each end of the highlighted area. Tap the crossed out S. A line will be placed through the highlighted text. To delete a strikethrough, tap the red strikethrough line to and then tap the delete icon. Once you have evaluated the assignment and left specific feedback throughout, you may wish to provide feedback relating to the entire assignment. On the assignment page, tap the pencil icon at the top right to open the Feedback summary page. Tap the pencil icon to the right of Text Comments. In the Edit Text box, enter your text comment, then tap Done. You may only leave one voice comment per assignment, and this one comment is limited to a length of 3 minutes. Tap the Record button next to Voice Comments. Record your comment using the iPad's microphone, tapping the Pause button as needed. Tap the Stop button when finished. A delete (rubbish-bin) button will display, which you can tap to delete the voice comment. Using a rubric can speed up marking, automate the calculation of marks and make marks more consistent throughout a class or between multiple markers. A rubric must have been created in the Moodle course, or on the course's Turnitin website, to be available for use in marking an assignment. Tap Open Rubric button on the left-hand side under the grade, you can also swipe to the left. The rubric displays. For each row of the rubric, tap the cell that best represents the student's achievements. When you have made all your choices, tap Apply % to Grade at the top right. In the Edit Grade window, enter the mark. Tap outside the window to save the mark.